This statement from 1971 seemed sufficient because the whole point of my book was not to suggest that Chomsky worked directly on military research but, rather, that he had to move mountains to avoid doing so. The mere threat of his work being used for military research was enough, I argued, to prompt him to resist, steadfastly refusing to help with engineering or other practical applications. Chomsky’s linguistics remained at all times so abstract and other-worldly that it could not be used for any practical purposes at all, let for alone direct military ones. However, since finishing my book, I have become aware that the situation was more nuanced. In the early 1960s, Chomsky acted as a consultant on an ambitious Air Force-funded project whose military purposes were plain enough. A follow-up article by Keyser was published by the MITRE Corporation in 1965. Here, Keyser discusses the limitations of the various artificial 'control languages' then being used in the military’s command and control systems. 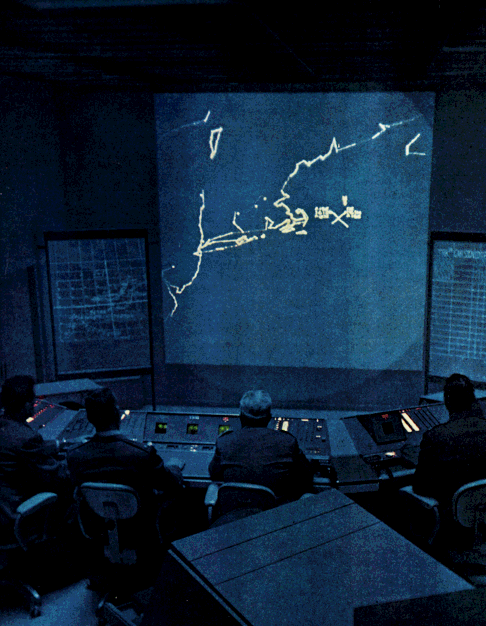 He refers both to the SAGE air defense system (pictured at the top of this page) and to the various computer control languages of the US Air Force (473L), the Navy (NAVCOSSACT) and NORAD (425L) etc. The bomber the fighter the radar spotted attacked landed safely. The model of language underlying the analysis procedure is that of transformational grammar as developed in particular by Chomsky. The linguistic framework within which almost all of the current work in language processing is carried out involves the theory of language developed by Chomsky and others that was introduced in Syntactic Structures, and elaborated on in Aspects of the Theory of Syntax. 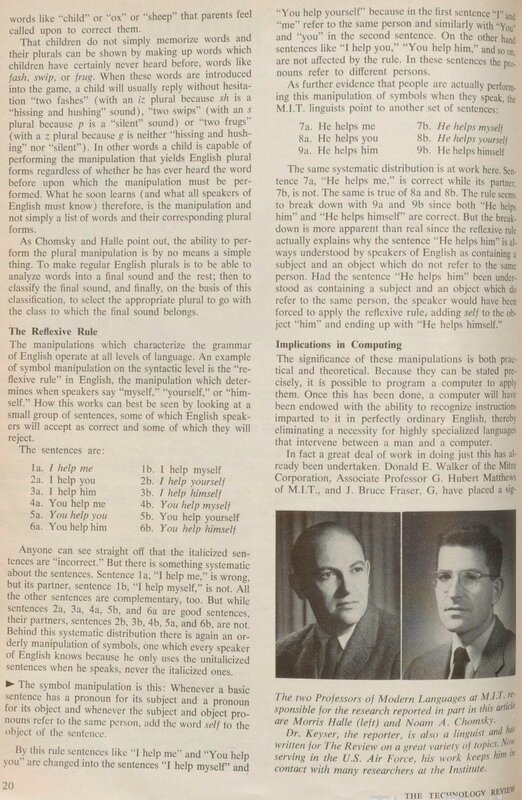 The MITRE English Preprocessor ... system was intended to translate English sentences into instructions in a formal command and control language, but almost all of the research has gone into the development of the transformational grammar and a procedure for performing the syntactic analysis. Throughout this period, the connection between this MITRE project and MIT remained strong. According to Donald Walker's biographer, at least 10 MIT linguistics students 'played a key role, often spending their summers at MITRE'. All of these would have probably been Chomsky's students at some stage. 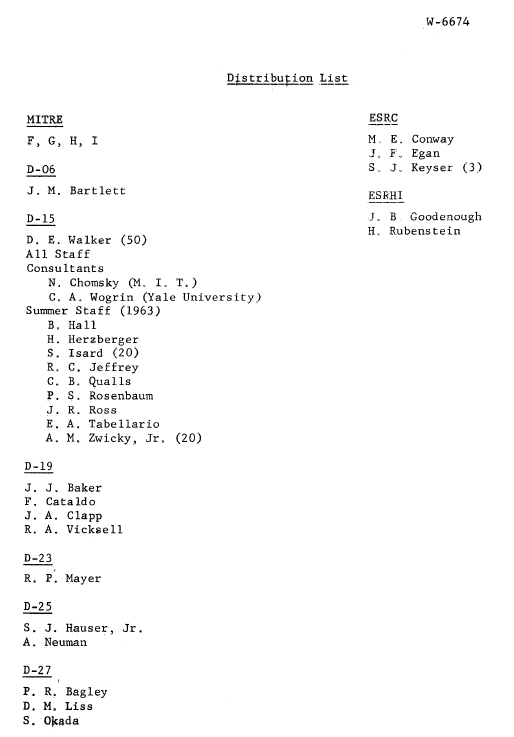 The specific documents which clarify Chomsky's relationship to this military project are two restricted-access papers from 1963, both of which name Chomsky as a 'consultant' to Walker's department at MITRE. It is difficult to know precisely how Chomsky felt about working as a MITRE consultant during these years because, to my knowledge, he has never discussed this in public. But we do know how he reacted when his wife, Carol, began working on an Air Force project at MIT in 1959. The project was intended to enable 'the business executive, the military commander and the scientist' to communicate with computers in 'natural language'. According to the project's head, Bert Green, Chomsky was 'very nervous' about all this and required reassurance because he feared that his wife might end up working on 'voice activated command and control systems'. Maybe Chomsky, too, managed to persuade himself that working on this project was somehow consistent with his anti-militarist conscience. But he would surely have felt uncomfortable had his linguistic research in real life helped the military to accomplish what they wanted, which was an ‘operational language for command and control’. Fortunately for the consciences of both Partee and Chomsky, their research failed to produce anything that actually worked. As the former Air Force Colonel Anthony Debons, wrote in 1971:. After a couple of years of involvement with the MITRE Corporation, Chomsky seems to have had enough. As he said later about this period, 'I couldn’t look myself in the mirror any more' and, from 1965, he threw himself into political activism in a determined attempt to halt the war in Vietnam. From then on, as Chomsky’s political positions became more publicly known, whenever he modified his linguistic theories he did so only in one direction: never toward greater realism, always toward what Adele Goldberg has rightly described as 'ever-increasing layers of abstractness'. Instead of studying languages, Chomsky focused exclusively on something of his own making - Universal Grammar. Since this could not be precisely specified, Chomsky’s approach had one great advantage. It soon became clear that nothing worked, or could possibly work. Once this realization sank in, Chomsky the activist was safe. Never again would the US military imagine they could use his work to develop systems of computerized command and control. Unfortunately, this same abstractness meant that his models had little apparent relevance to what the rest of us term ‘language’, offering few insights into how language might have evolved in the past or how it is continuously being created and re-created by speakers today. Samuel Jay Keyser has told me that he was the Air Force contract manager for Chomsky's 1965 book, Aspects of the Theory of Syntax. Keyser was head of the Department of Linguistics at the University of Massachusetts at Amherst from 1972 to 1977, in which year he went on to become head of MIT's Department of Linguistics and Philosophy, two years later becoming concurrently director of the Center for Cognitive Science. In 1985, future CIA director John Deutch, the newly named Provost at MIT, asked him to become associate provost, to which position he was appointed.
. F.J. Newmeyer, The Politics of Linguistics, 1986, p85–86.
. Technology Review, February 1964, p20-1.
. S.J. Keyser in J. Spiegel and D. Walker, 'Linguistic Theory and System Design', Information Systems Sciences, 1965, p495-6, 499-500, 515; R. Meisel and J. Jacobs, MITRE: The First Twenty Years, A History of the MITRE Corporation (1958 -1978), p65.
. R. Meisel and J. Jacobs, p114-5.
. D. Walker et al., 'Recent Developments in the MITRE Syntactic Analysis Procedure', The MITRE Corporation, Bedford, MA., 1966, p2.
. D. Bobrow et al., 'Survey of Automatic Language Processing 1966', Air Force Cambridge Research Laboratories, 1967, p3.
. A. Oettinger, Mathematical Linguistics and Automatic Translation: Report to the National Science Foundation, 1967.
. A. Newell in G. Bugliarello (ed. 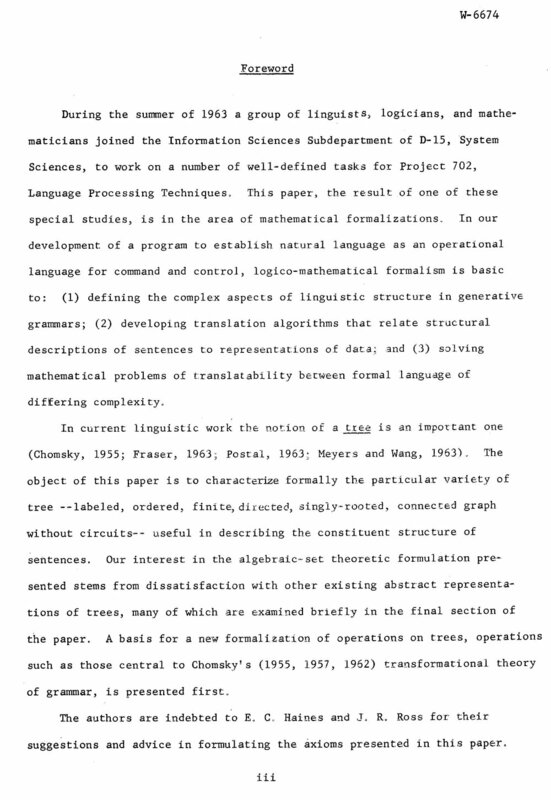 ), Bioengineering: An Engineering View, 1968, p271.
. A. Zampolli et al., Current Issues in Computational Linguistics: In Honour of Don Walker, 30 June 1994, pxxi-xxii.
. A. Zwicky, 'Grammars of Number Theory: Some Examples'. 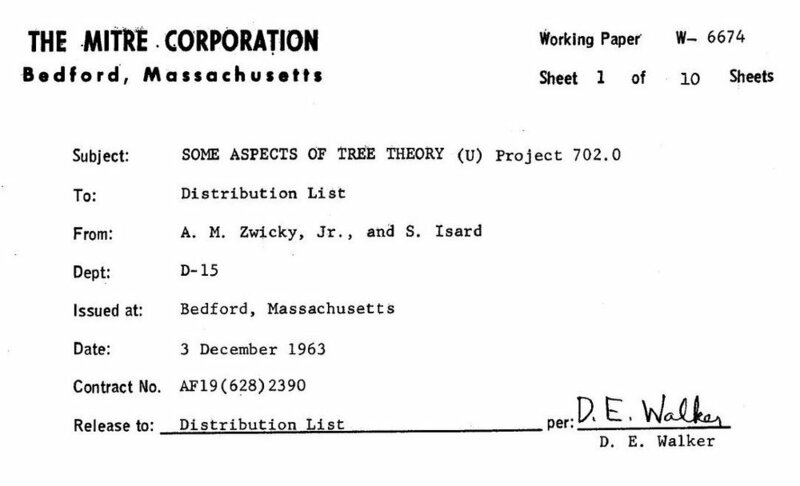 Working Paper W-6671, The MITRE Corporation, Bedford, MA, 1963, Foreword, back page; A. Zwicky and S. Isard, 'Some Aspects of Tree Theory', Working Paper W-6674, The MITRE Corporation, Bedford, MA, 1963, Foreword, last page.
. B. Green, C. Chomsky et al., 'The baseball program: an automatic question answerer', (MIT Lincoln Laboratory 1963); B. Green, Digital Computers In Research (McGraw-Hill 1963), pviii, 238-48, 258; 'Profiles in Research: Bert F. Green', Journal of Educational and Behavioral Statistics, vol 29, no. 2, summer 2004, p263.
. B. Partee, 'Reflections of a Formal Semanticist as of February 2005', p8n.
. A. Debons, 'Command and Control: Technology and Social Impact', in F. Alt and M. Rubinoff, Advances in Computers, Vol. 11, 1971. 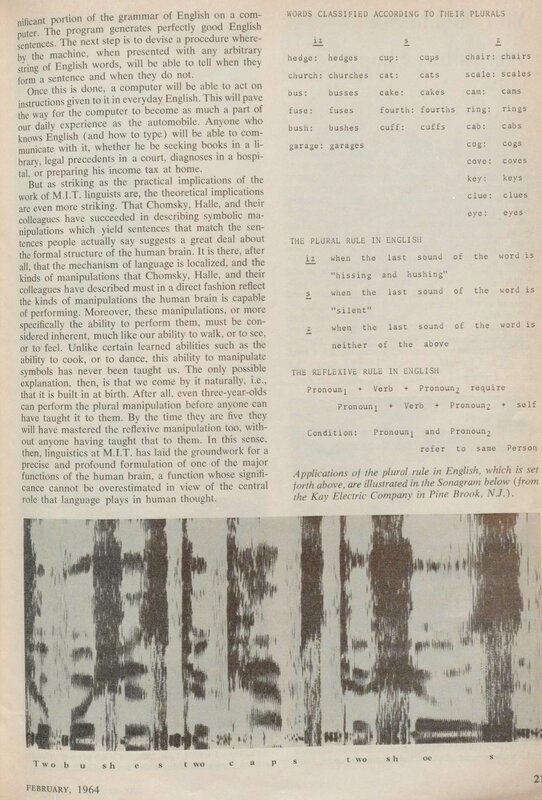 New York/London 1971, p354.
. Chomsky quoted in R. Chepesiuk, Sixties Radicals, p145; N. Chomsky, American Power and the New Mandarins, 1969, p8.
. A. E. Goldberg, Constructions At Work: The nature of generalization in language. Oxford: Oxford University Press, 2006, p.4.